A trip to the Eftalou Thermal Baths is a wonderful excursion for anyone on holiday in Lesvos. 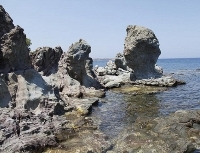 The hot, natural springs are located nearly three miles (4km) outside of Molyvos on the northern coast of Lesvos. Highly popular with tourists, the Eftalou's Springs are located at the beach and are one of the few springs in Greece where men and women can bathe together. The temperature of the water is between 109 and 116°F (43 - 47°C), which is very hot. Bathing in the water is recommended for a number of conditions and illnesses including blood pressure problems, rheumatism, gallstones, and neuralgia. It is also just extremely relaxing and therapeutic! It is recommended, though, that visitors don't stay in the water for longer than 20 minutes in each session due to the extreme heat. There is an old, domed bath house, which has a charming, old-fashioned atmosphere and is an experience in itself, and a newly renovated spa building next door to it which offers a variety of treatments and facilities. The coastal setting is also pretty and enjoyable which adds to the experience. A novelty for children, this is an activity the whole family will enjoy.